Stop the rats, wild birds, squirrels and other vermin from stealing your feed and spreading disease. Cut your feed bill in half! Assembly and training instructions are in the tab sections below. Five minute assembly, fast training if you follow our directions. Do you have chickens and rats? Or chickens and wild birds that are eating more feed than the chickens? Here is the solution. But before you buy look for the different versions of our feeder, this is the original version, there is a soft close version, an exterior version, and a soft close exterior version. There are also multi packed feeders that can lower the shipping costs down to as low as $9 to $12.00 each depending on how many and distance. If you need to stop rats, mice, and wild birds from eating your chicken feed then this will work. The medium rat proof treadle chicken feeder hopper holds 26 pounds of laying pellets or other feed and has a 100% galvanized sheet metal feed tray and hopper so the feed flows easily and sanitation is assured. Generally a laying hen eats around 4 ounces of feed per day, so one pound of feed should feed four birds one day, 7 pounds per week per four birds, or 3 1/2 weeks per full hopper of feed for a four hen flock. The feeder is designed and marketed for full size birds. If you have bantams or other than full size birds please read our FAQ section on our main website. There is a lot of info on that web page including videos. Approximate assembled size is 18” deep x 14” wide x 19” tall. 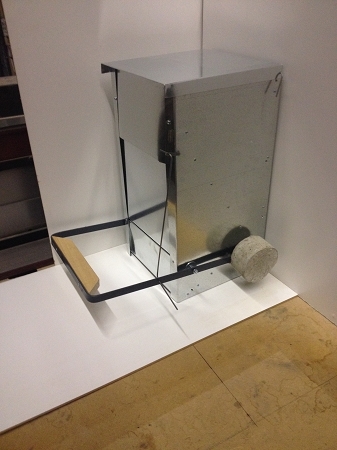 The actual feeder hopper is about 11" x 10" x 14" tall, partially rectangular, partially triangular shape where the door has to swing back against the feed hopper. Shipping weight is around 15 pounds with packaging for the medium rat proof treadle chicken feeder. When you are ready to purchase add the item to your cart and then scroll down to find the PayPal icon to automatically insert your shipping information. You will need to add your daytime phone number for FedEx Ground. For more information about the feeders visit our main chicken feeder web page. Here is one recent review on this product. The lady had rats tunneling under her coop causing structural damage, saved 20% per day in feed costs for 25 hens, and is getting three to four extra eggs per day, which probably meant that the rats were eating that many eggs or were stressing the hens enough to impact egg production. I purchased this feeder a couple of years ago and it worked like a charm...Beforehand, the cats couldn’t keep up with the rats in the chicken coop and we were being overrun. Not only have the rats left, but our bill for organic feed has fallen dramatically…the only snag I found was educating our very silly hens to use the feeder. There likely are varieties of hens that are less flighty and would be easier to train. Even so, the hens have adjusted and are doing well. I have recommended this product a number of my friends who have chickens or who have clients with chickens together with offering the loan of a hen to instruct their barnyard in its proper use. I have 2 separate groups of 3 and 4 hens. One group learned in a couple days how to use feeder tho mainly one hen uses it, others eat from sides. Other group are slow learners. After 3 days one hen will jump on perch if I open it but I have not seen her use it on her own. The rest are afraid. I haven't fed them anything so they gotta be hungry! Will see after a week how smart they are. Feeder is well built and easy to install. It is very loud opening and closing with a bang and I feel this is part of the problem of their fears. It definitely seems rat proof which is my problem. It is under cover in my coop. If I could suggest improvements, they would be for some kind of lexan type door so chickens could see feed for motivation and I could monitor feed level without having to look inside. Also that door did not slam. I even put little tabs that go on bottom of chair legs which helped a tiny bit. Also that the roof would be sloped so hens would not roost on top. But if chickens learn to eat out of it, I will be happy. All in all, good product that I am glad I bought. I ordered 2 of these. They came sooner than expected and in perfect condition. They were easy to assemble and my chickens learned to use them very quickly. So far it's been only a few days, and although I see a few rats in the evening, they haven't been able to get into the feeders. This will be a huge savings. I haven't had the feeders even a week yet -- the rats will eventually relocate, I'm sure. My only problem was that the California Whites are much too small to use the counterweight with, and the door doesn't close tightly using the spring only unless the chickens jump off. If they just step off, sometimes the door has a 1/8" opening. Love this feeder. I was being over run with the neighborhood birds eating all of the chicken feed, but not anymore. Putting it together was easy after watching the video, although I wish the directions were more specific for which direction to install the rod that connects the treadle to the door. My door was sticking a bit and when I re-read the directions it said that if that happens the rod is in the wrong way. Why not just tell us the correct way to install it in the first place? Other than that it did take my girls about 3 days to figure out that the feeder wasn't gonna kill them. They're still a little freaked out when one of them steps off the treadle and the door slams shut. But...they did learn, and the neighborhood birds are no longer a nuisance!! I would definitely recommend this feeder and would purchase it again. This is the best feeder on the market. It has saved me a ton of money, and unlike the Wood Treadle Feeders, (which will be chewed into) this one is all metal. It took my chickens about two days to start using it on their own. This company has excellent customer service. Little mice were climbing in the back at the top, I hung 3 metal door hinges ( a girls fix) and twala no more mice. Wow my feed bill has gone down tremendously, and all the sickness the birds and mice bring are coming to an end,!!! Thanks for such a great product!! Ordering a second rat proof treadle chicken feeder! I ordered a second rat proof treadle chicken feeder! My chickens are getting used to the first one and it seems there isn't quite enough room for them all to eat in peace. New, Improved Medium Ratproof Chicken Feeder is even more awesome! We bought an original Medium Ratproof Chicken Feeder a couple of years ago. Because of weather, the metal piece under the door rusted out. Other than that, it was an amazing feeder. We liked it so much that we recently bought a new one. My husband put it together, and he said that it is higher quality than the first one. In addition to being ratproof, it also keeps the feed clean, unlike many other feeders. We are extremely pleased with it, and would highly recommend it to anyone looking for a rodent-proof chicken feeder. I was thrilled when I saw my friend's rat proof feeder. It looked like it actually worked. I ordered this one and did exactly as the instructions said to train my chickens. They had it down by that evening. Even my leghorns were able to figure it out since it is a little trickier for them because they are smaller. There is hardly any waste because they have to balance on the treadle and stretch for the food. The rats and ground squirrels are very mad because they don't have free reign any more. I have about 30 chickens and they are doing just fine with one feeder since they just take turns to eat. I did order another one that I will introduce to my younger ones without the counter weight so when they get merged with the older gals they don't have to learn a new feeder also. Definitely worth the cost. Your feeder works very well -- very easy to pay for itself. This is a second unit -- I am getting this for my neighbor as a gift. Your feeder works very well -- very easy to pay for itself. Also, I "seeded" the feeder with meal-worms to help train my hens to begin using it. The Unit was packaged adequately for protection during shipment. Assembly was fairly simple - although there was a bend in the connecting rod that I had to "move" to get the door to open all the way. Combining the spring and the counterbalance weight was too much for our chickens, as it took over two pounds on the pedal to open the door. I took the spring off and instead added a plastic bottle of pebbles secured to the weight with a zip-tie so that it would take 1-1/2 pounds on the pedal to open the door. The door was not completely flat and takes a full 1-1/2 pounds to hold it closed all around the opening. The door would hold much flatter both open and closed if it had some 90 degree flanges or a large rolled-edge around the edges. As it is, it has been welded onto a hinge rod which makes it non-removable for any door improvements. It took our chickens a couple weeks to really figure out the pedal and have the courage to step on it on their own. One of them still hasn't really gotten it yet and just eats the spillage, which might go away if I make the lower lip a little higher. Also, the pedal is made of some nice hardwood, but I really need to make it bigger so the chickens have something a little more substantial to stand on. Perhaps if I make it large/heavy enough I'll be able to re-incorporate spring that the feeder came with. We're saving money on food for sure - probably due to the chickens having to work harder for it - and we don't see the rats around anymore, so overall we're happy with the purchase. Just a note to say I love my automatic chicken feeder and will be ordering another one soon. what a great value. The chickens were puzzled by it at first but now they get it. and it is sooooo well made. Thank you! It's been about three months since I started using my treadle feeder. This Has to be the single best thing I've ever purchased for me and my chickens! It makes life easier. Since I have an ultra small flock I only have to fill it once every two weeks. Keep up the great work! The metal parts of this are well constructed but cheap wood and screews were used. The flapper door is sheet metal suspended on wood by two screws. This had become detached during shipping. It was a quick and easy fix, but annoying to deal with in a new product. The foot pedal wood is the same low quality. It would be a good idea to paint that piece or it won't last long. My chickens are still figuring it out, but it has stopped the rats, so in that regard it works as advertised. Happy the product was made in the Philippines. Assembly directions slightly difficult to follow but watching online video hepled figure it out. Hens learned in about 3 days, DO NOT supplement food during training period. I placed hens on perch to help them learn. Wall mounted, so i provided a step up to feeder. Weight could be redesigned. Seems to be keeping rodents out of food. Food waste GREATLY reduced. Would buy it again. First of all, I really love your product! I have chicks in the city and, when I let them out of the coop to pasture, I had every bird and squirrel in the coop eating the food. That doesn't happen anymore! Thank you! This is great feeder, my chickens learned in 3-4 days. I wish you can make larger one , it can store 50 lbs of food. It will be no worry for two weeks if i am out of town. Order arrived very quickly. Easy to assemble. Chickens learned to use feeder in 2 to 3 hours. I highly recommend. Good product at a reasonable price. It took the hens a few days to catch on but they are happily fighting each other for position now. I probably mounted it too high off the floor initially but they caught on once I lowered it. So far so good! My 2 chickens and 2 ducks learned to use this within a few days. Easy to assemble. I am very happy and recommend this feeder over more expensive ones. We just recently built a brand new coop so I bought 2 of your medium feeders. Took no time at all for my chickens to learn how to use them. Makes doing chores easier for me as well. Highly recommend these feeders!! Keep up the skilled work. I love my Chicken feeder and I have had great results from your unique design! Great design simple installation . Would recomend a way to lock up at nite to keep raccoons out of it. Birds figured it out in a couple of days. I am very pleased with this chicken feeder. I am so pleased with it I will be purchasing perhaps 2 more! Very simple to assemble and best of all it's made right here in the good old USA! Q: Does this have to be mounted on the interior of the coop or is it able to be set outdoors? Thank you! A: It needs to be secured to a wall or solid post to prevent it from rocking around once it gets close to empty. A seven pound bird jumping on the treadle will make it dance around and shake too much feed down into the feed tray. It isn't totally waterproof either, rain can hit the door and run down into the feed if the wind is blowing against the door. If blowing the other way the water will drip straight down and the feeder will remain pretty dry. It is really designed as an inside feeder although it would do okay under a shed roof. Was this answer helpful? 14 of 15 Customer(s) found this Answer helpful. A: The answer used to be no but we have a new shipping method for double orders where you can save 23% on shipping, a feeder can get to parts of Californian now for $17.68 per feeder. The feeders will pay for themselves in feed savings within a year. They aren't cheap to ship because they are bulky for their weight. Dimensional weight kicks in so a 15# feeder ships at 20# cost. Q: What prevents rats, squirrels, etc. from stepping on pedal and opening door? Or did I miss something? First, the door is spring loaded so a squirrel or rat or several of the same aren't going to be strong enough to push the door open. Rats and squirrels are too light in weight to depress the treadle but even if they did the treadle step is so far back that they couldn't reach the feed. A pack of squirrels, usually a set of juveniles with their mother might possible cooperate but squirrels are territorial and are not likely to cooperate otherwise. Q: I am wanting to order a medium feeder, but I have Bantams so I will need a shorter bar for them to stand on. Is that an option? Look for the Duck Step in the Rat Proof Feeder section of our shopping cart. They install with two wood screws. For bantams you are better off adding this light weight platform for the lighter and shorter birds. However doing that reduces the rat proof ability of the feeder. You are better off letting the bantams learn to eat from the side of the feeder when another bird is using the feeder. The feeder works because of the weight difference between a rat and a chicken and the difference in "reach" so anything you do to shorten the reach or lightening the amount of force required to operate makes the feeder less resistant to rats. Q: 2 years ago purchased a similar chicken feeder and think that the rats are getting in because the door can be easily opened by hand without stepping on the treadle. Does your product differ? Read our reviews, lots of people have solved their rat problem with our feeder. Q: I am interested in purchasing your medium feeder. Can it be used freestanding, or does it need to be mounted to a wall? A: The feeder needs to be secured to a wall or post or a large chunk of plywood if you want it freestanding. Several reasons why, first it would tip over once the feed got low if a good size bird jumped on the feeder. Second, the feeder would rock around and that would shake too much feed into the lower feed tray and the birds might start raking feed out if the feed levels got that high. Third reason, the impact of the door would also increase the amount of feed in the lower tray if the feeder wasn't secured to some sort of weight like a wall, a post, or a chunk of plywood that would dampen some of the impact vibrations. If you use plywood, make it around 16" x 24" minimum, place the supplied wood standoff/mounting block on the center of the plywood and screw it in place, then set the feeder over the block and insert two screws from each side to secure the feeder. Make sure the plywood isn't rocking around, shim it, pour a but of cement grout under it if on a concrete floor, or drive some small wood stakes flush with the ground and put some screws into them if on a dirt floor. Q: We have 25 chickens, 3 ducks and 2 turkeys....So, how may feeders would you suggest and can the ducks and turkeys eat out of them too? A: We now have Duck Steps and Turkey Steps available, add on extension plates for the original rat proof feeder. You can order them separate or add them to a feeder order. Two feeders will handle 25 chickens with a bit of crowding early in the morning. Ducks have been reported to eat from the side but most customers with ducks say their ducks won't step on the treadle unless you add a wider step to the treadle plate and that defeats part of the ability to keep the rats out. Turkeys are too large to use their feet but customers have reported that they will learn to use their breast muscle to depress the treadle. Or use the Turkey Step and mount the feeder a bit higher than normal. A: We now have USPS shipping on the shopping cart but the rates aren't always cheaper than FedEx Ground or Home Delivery. If you want to save money on shipping check out the 2 pack, 3 pack, and 4 packs where you can drive the cost of shipping down to the $12.00 per feeder range. Find some neighbors or friends and place a bulk order. U.S. Post Office rates are about ten percent higher usually than FedEx Ground so you won't save any money. Remember that this is a fairly bulky product, holds a half sack of feed, so it is going to be expensive to ship. Other products bury the subsidized cost of shipping in the cost of the item, we think that is dishonest or they sell on Amazon and you wind up paying about 15% over the real price of the item so the seller can recover Amazon's huge commission. Q: What are the dimensions of the small and medium feeder? A: Both small and medium feeders are about 19" deep including the treadle step or around 12" just for the galvanized metal feed box. Both are the same height, around 22" or so. The medium feeder is around 11.5" wide for just the galvanized feed box and around 15" wide if you include the counterweight. The small feeder is 4" less wide than the medium, so around 7.5" wide or 11" wide with the counterweight installed. If you have not visited our main web page on the feeder it has a ton of info on sizes, FAQ's, and videos on assembly and use. Here is the web address, just copy and paste it into your browser. The shipping on the feeders isn't cheap because they are two cubic feet and weigh 15 pounds. Local states should cost $15.00 to $21.00 and the furthest states will run up to $25.00 or $28.00. Sales channels like Amazon or Ebay have cheaper freight on items but what most customers don't realize is that sellers are forced to bury around half of the cost in the price of the product! If the seller is selling Prime/Fulfilled by Amazone (FBA) they pay the inbound shipping AND out bound shipping. We used to sell on Amazon Market Place and the maximum shipping allowed for a fifteen pound product is $12.00, half the cost of the actual shipping to California or to the East Coast. Then there is another $12.00 in selling fees (including 15% of the ultra low shipping costs!) so the sales price on Amazon had to be $24.00 higher to cover the hidden fees. We sell on Ebay the cost is around $15.00 more to cover the additional costs. The feeder can be fastened to a plywood base if it needs to be freestanding. Fasten the wooden block to the plywood base, then put a couple of screws through the side of the feeder. Usually the lid must be pushed to one side to get it to close completely. Or we have our Slow Boat Shipping Program that holds orders for a maximum of three weeks to bundle with other packages in that same zip code. Only one centrally located customer address is chosen as the pick up point and all packages are shipped to that same address. The other customers will need to pick up their feeder at the pick up point after business hours. To facilitate we will put everyone in the shipment in touch via a group email and the packages will need a signature upon delivery by the shipping company and by the customers that are picking up their order. This method isn't available for Alaska or Hawaii. Even if we used Amazon fulfillment the cost of warehousing feeders around the country and the cost of shipping the feeders to those warehouses would bring us right back to the same costs as shipping from our Oklahoma shop. A competing product sold on Amazon that holds the same amount of feed costs $99.95 but it has "free shipping", meaning you actually pay $34.95 for the shipping and selling fees. That product is the green plastic and sheet metal one and it is being dumped on the U.S. market after the Dutch company couldn't sell them in Europe due to design flaws that allow rats, wild birds, and squirrels to simply push the door open! This Dutch company is wholesaling them at $40.00 plus freight on a pallet of them and several retailers like Rentacoop and Hog Slat are keystoning them (doubling the cost). Hog Slat has a warning about the vermin being able to chew through the plastic parts of the feeder and the ability to push the door open, in bright red text but at the very bottom of the web page. The Amazon page for the product has a 30% critical (negative) reviews rating. It is a pretty feeder but it is also pretty bad.